After Adam Wainwright's injury, what's next for Cardinals, DH rule? In the wake of Adam Wainwright's season-ending injury, Cliff Corcoran and Jay Jaffe debate its impact on the Cardinals and whether or not it's time for the NL to adopt the DH. The Cardinals are off to a strong start this season, sitting in first place in the National League Central entering Monday with a 12–5 record. But St. Louis will now have to go forward without one of its most senior and dependable players: ace Adam Wainwright, who is done for the season after injuring his Achilles tendon while popping out in Saturday's game against the Brewers. Can the Cardinals survive the loss of their veteran righthander? How will St. Louis fill the void that Wainwright's injury creates in its rotation? And with Wainwright now the latest pitcher to hurt himself while at bat or on the bases, is it finally time for the NL to adopt the designated hitter? Cliff Corcoran and Jay Jaffe tackle those questions and more. How much does Wainwright's injury affect the Cardinals? Jay Jaffe: Obviously this is a big blow, because Wainwright is on the short list of candidates for baseball's second best pitcher (behind Clayton Kershaw). The NL Central does seem to be in a state of upheaval with the Brewers and Reds no longer contenders and the Cubs emerging as one, so maybe the division won't be quite the dogfight that it's been in recent years. That would give the Cardinals a bit more breathing room, but this is still a painful blow. What's interesting to me, though, is the opportunity—and added pressure—it creates for their younger pitchers. This is where we will see if Michael Wacha and Carlos Martinez can evolve into the rotation anchors that many believe they can be. So far, those two have been great, with respective ERAs of 1.33 and 1.35 through three starts. They're not going to sustain that level of dominance, but the expectation remains that they can be front-to-mid-rotation guys. Likewise,St. Louis will eventually have decent options for the fifth spot in Marco Gonzales and Jaime Garcia, though both of them are battling shoulder issues, so it’s probably not a good idea to do too much chicken-counting. ​Cliff Corcoran: The chicken counting is the big concern here. Yes, Wainwright is a perennial Cy Young contender (he's finished in the top three in four of his last five healthy seasons) and a four-win player per Baseball-Reference.com’s Wins Above Replacement. But he’s also a horse, averaging 226 regular-season innings over those last five healthy years and adding an average of 22 postseason innings over the last three years. Wacha might have the ability to emerge as a replacement ace the way Chris Carpenter did in 2011—when Wainwright was lost for the season due to Tommy John surgery, but the Cardinals still went on to win the World Series—but he has never thrown 150 innings in a professional season, and he tossed just 107 frames last year in what was supposed to be his first full major league season. Martinez, meanwhile, has never thrown more than 108 innings in his first five professional seasons, and he spent his first two major league campaigns in '13 and '14 almost exclusively in relief. Whoever ultimately winds up as Wainwright’s permanent replacement this season will come with similar workload concerns. Gonzales, a 2013 first-round pick, might be the preferred option based on talent, but he's on the Triple A disabled list with shoulder tightness. Ironically, his injury, if it proves not to be significant, might help alleviate that concern about workload because St. Louis can’t call him up immediately and ask him for five or six months of help. Instead, it will have to fill some starts with the likes of Tim Cooney or Tyler Lyons before turning to Gonzales, who threw 162 2/3 innings last year across three minor league levels and the majors (playoffs included). Still, with Gonzales hurt, Garcia still trapped in the phantom zone of chronic shoulder issues and Wacha and Martinez with such limited track records as starters, the loss of Wainwright is an even more significant concern than it would be if the Cardinals had a middling innings eater ready to step into the rotation. Even without Wainwright, St. Louis is clearly one of the NL’s best teams. However, the Pirates and the Cubs are off to strong starts, so it’s not absurd to think the Cardinals, who were heavy division favorites in the preseason, could fall back into a wild-card spot. That's where the loss of Wainwright would again become acute, as he would not be available to start the Wild-Card Game. Jaffe: That's a very good point about the workloads of Wacha and Martinez—less because they're particularly unproven and more because of the fact that they're likely to be treated as the 23-year-old arms that they are, and protected once they approach a certain number of innings. Should the Cardinals make a move to add a starter? Jaffe: Assume a team has to get somewhere around 950–1,000 innings from its rotation, as the Cardinals have done every year since 2008 while making the playoffs five out of seven times. 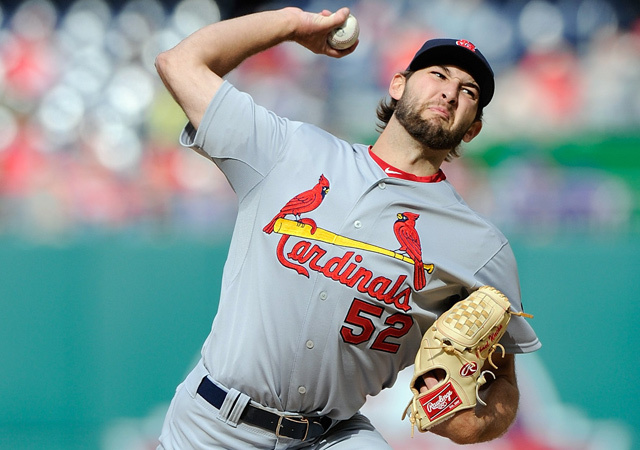 if they get 200 innings apiece from John Lackey and Lance Lynn and then only 162 from Martinez and Wacha (pictured above), they still need anywhere from 218 to 268 innings from the other guys to get to that range, and good innings at that—and that's if everything goes right. Maybe Cooney, Garcia, Gonzales and Lyons cobble some of that together, but the odds are that they won't be of high enough quality, which means that St. Louis will still need at least a mid-rotation guy. And again, that's if everything goes right. I can't see a trade for Cole Hamels happening given what we know about the Phillies' recent demands and the Cardinals' desire to hold onto Martinez. St. Louis is not going to be able to deal with the Reds for pending free agent Johnny Cueto—assuming he inevitably goes to market—both because intradivision trades are tough to pull off and because there's some ugly history there dating back to Cueto's role in a big brawl between those teams back in 2010. David Price? Not happening given the Tigers' excellent start and the question marks around Justin Verlander. Maybe the Cards can hope that the Nationals keep sinking and are willing to part with either Doug Fister or Jordan Zimmermann, but even if that's the case, St. Louis probably has to survive three more months before that opportunity presents itself. More likely is that the Cardinals will have to find this year's equivalent of Lackey—a mid-rotation innings-eater—because the difference-makers are going to be very scarce. Corcoran: Agreed. I've seen Kyle Lohse's name floated, and I think that's more along the lines of the type of addition they're likely to make. Lohse is in his walk year with the Brewers, and though he's 36 years old and off to an awful start, the fact that Milwaukee is already seemingly out of it would render any concerns about an intra-division trade irrelevant. He's also affordable, and he's a former Cardinal who had his best season in 2012, the last of his five years in St. Louis (admittedly under former pitching coach Dave Duncan). Still, even if the targets are less spectacular than Hamels and Price, it would seem to be a given that the Cards will add a starter of some kind if Wainwright really is lost for the season. Is it now time for the National League to adopt the designated hitter? Corcoran: While I believe that, objectively, it is beyond time for the NL to add the designated hitter, I'll admit that I can't completely commit to the concept emotionally. As absurd, pointless and counterproductive as it might be to have pitchers hit, it still has its charm, and baseball's charm is very important to me. Still, if I were starting the National League today, I'd absolutely include the designated hitter. I would not, however, make that decision because of concerns about pitcher injuries. I don't think that hitting and base running-related pitcher injuries occur often enough for that to be relevant to this discussion. The argument over the DH in the NL should be entirely about the fact that pitchers are not major-league-quality hitters. Asking pitchers to hit is like asking managers to play shortstop: It may be entertaining on occasion, but it severely lowers the quality of the product on the field. It impacts not only the spot in the lineup in which the pitcher hits, but also the spot in front of him. And it affects the pitchers’ performance on the mound, be it via managers removing pitchers early for pinch-hitters or pitchers struggling in innings after having to run the bases. And don’t get me started on the double-switch, which downgrades yet another spot in the lineup because of the looming threat of a pitcher having to hit. I don’t watch baseball to see managers manage. I watch to see players play, and having pitchers hit is absurdly disruptive to that goal. So, yes, it is time for the NL to adopt the DH, but not because of a fluke injury suffered by Wainwright (and, to a far lesser degree, Washington's Max Scherzer​, who jammed his thumb hitting a groundball last Thursday and is doubtful to make his start on Tuesday). Jaffe: At this point, I'm in favor of the DH in both leagues as well. I grew up on National League baseball and have been fascinated by the rare pitcher who could hit ever since Steve Carlton homered in the 1978 NLCS and since the batting stats of J.R. Richard were included in the book Baseball All-Stars 1979. By now, though, I'm completely over the idea of pitchers hitting, because they're just so damn inept. Sure, Bartolo Colon is fun to watch, but most pitchers are not, and the injuries are a complete drag—you can point to any given one like Wainwright's being a fluke, but why should we ever lose an ace in such a nonsensical way? It's hard enough to survive as a top-flight pitcher as it is. I'm just not swayed by the idea that the NL is imbued with some special holy status because it has resisted introducing the DH for 42 years; the game has always evolved in its fundamental rules (fussing with the definition of the strike zone) and practices (the adoption of the batting helmet). Besides, it's abundantly clear that teams don't care about their pitchers hitting. The long-term trend is that they continue to get worse at it and so devote even less time to it. In the wake of so many innovations driven by the introduction of analytics into front offices and teams looking for that extra edge, we have yet to see a team decide that stocking up on better-hitting pitchers is a worthwhile strategy, or that it's worthwhile to find a guy who can do both at the same time, as Brooks Kieschnick did for the Brewers in 2003 and '04. The NL system does not add a great deal more strategy. Pitching around the eighth batter to face a worse hitter is no-brainer territory for managers, as are most decisions to pinch-hit for a pitcher when behind in the game. The decision to have a pitcher bunt is in lieu of actually having a strategy. It's basically the "quick, look busy, they're watching us" of managerial practice. The bunts wind up creating near-automatic outs and lowering run expectancy. Give us hitters, please. Give us a place to park the likes of David Ortiz and Jim Thome so that they don't have to go through the motions of fielding.